Hello! 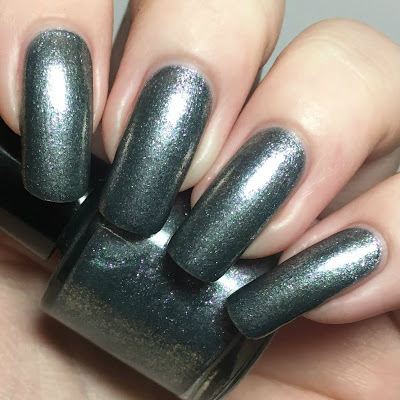 Today I'm back with swatches and a review of new indie brand OccasioNail. 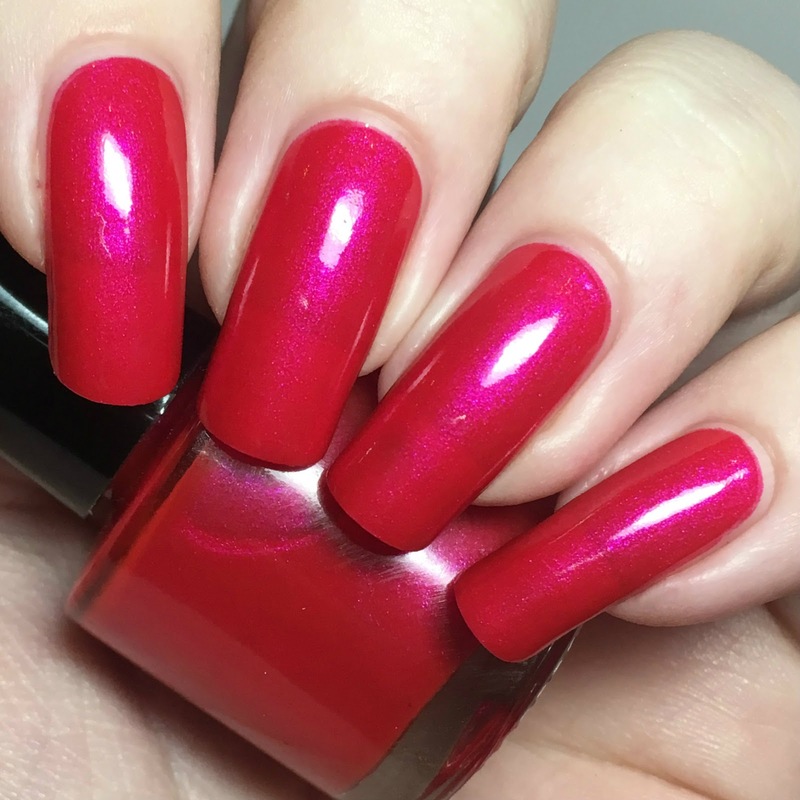 The owner of the brand Linda makes micro batches of polish for occasions such as weddings and birthdays, but also creates polish collections. Linda was kind enough to send me three polishes from the new Winter 2017 collection. They were carefully wrapped in butterfly tissue paper and packaged in cute little boxes. Read on for full swatches and more info! 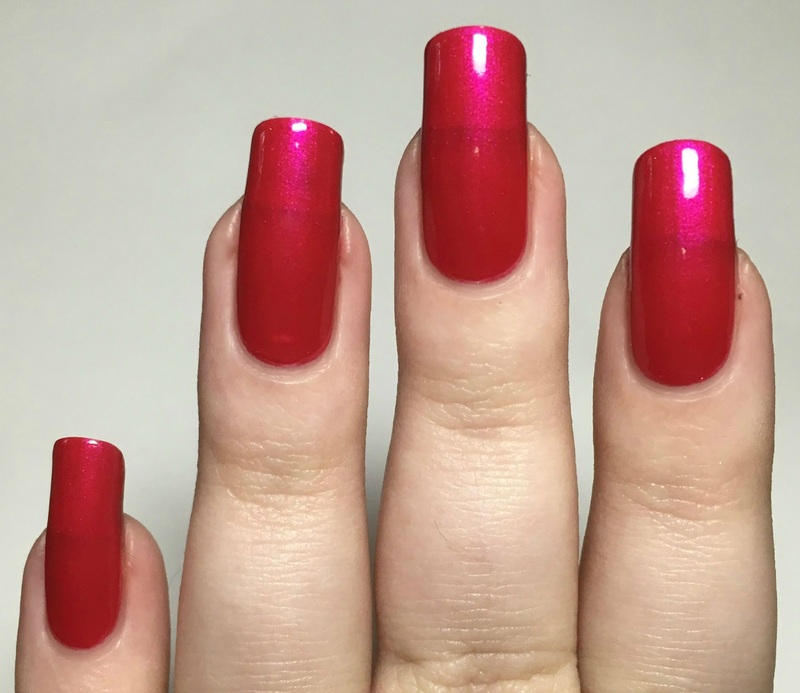 'Very Individual Pink' is a pink-leaning red with a bright pink shimmer. This is a bit sheer on the first coat, but applies smoothly and very evenly. It builds up to be opaque in three coats. You can see my nail line in the photos, but it wasn't obvious at all in person. 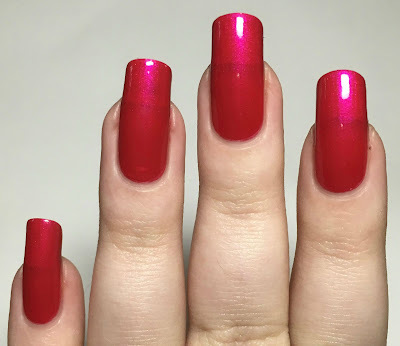 The pink shimmer translates perfectly to the nail. Below is three coats and topcoat. 'Almost Black, But Purple' is a deep purple base with a bright purple shimmer. This has a lovely easily to apply formula. It does start off a bit sheer and patchy, although builds up much better than I expected. It is opaque on the second coat, but I did add a third to cover some slight patches. Again the shimmer translates really well to the nail. Below is three coats and topcoat. 'Metal' is a metallic grey base with tiny bright pink flakes. This is the most opaque of the three and is fully opaque in two coats. You get a good amount of the pink flakes on the nail, and they lay nice and flat. The flakes are more obvious in person than in my photos - especially when they catch the light! Below is two coats and topcoat. What do you think? For a new brand, I'm really impressed! All three had very easy to use formulas - they weren't too thick, they didn't run or pool, they just stayed exactly where you put them. I also love how well each polish translated to the nail. Shimmer tends to show up better in the bottle and get lost on the nail but these look great! If I had to pick a favourite it would have to be 'Metal'. I love the little pops of bright pink! 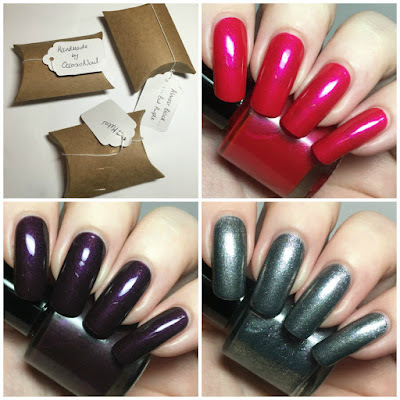 You can find all three polishes mentioned for £6.50 on OccasioNail's website here. You can also find the brand on Instagram here and Facebook here. The purple one is definitely my favorite - I feel you can wear it any season! I haven't heard of this brand before but all of these look great on you! Almost Black is so deep and mysterious! I adore it! That purple! It's kinda gorgeous! I like the other two, too! All three colors are great colors for any polish collection! These polishes look so pretty and that pinky/red is very pretty. Love your swatches. Almost Black But Purple takes my breath away! great polishes but I think I loved purple one most. I'm loving Almost Black, But Purple - it's got that inner depth. Almost Black, But Purple is a must have, for sure. Stunning shade! 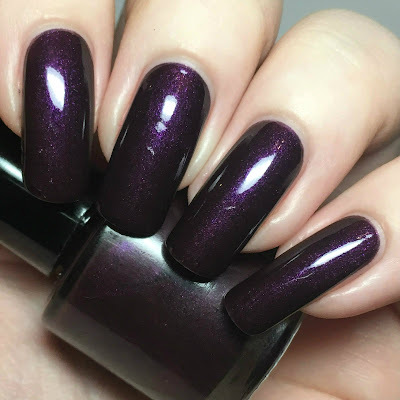 That purple, so vampy!!! I love it!! !